Coal bumps are influenced by geologic conditions, the geometric design of coal mine excavations, and the sequence and rate of extraction. 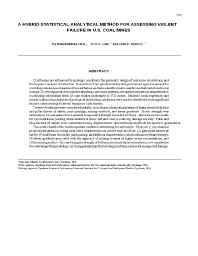 Researchers from private industry and government agencies around the world have studied mechanisms of violent failure and have identified individual factors that contribute to coal bumps. To develop predictive tools for assessing coal bump potential, the authors initiated a comprehensive study using information from 25 case studies undertaken in U.S. mines. Multiple linear regression and numerical modeling analyses of geological and mining conditions were used to identify the most significant factors contributing to stress bumps in coal mines.